Our Spidey senses are telling us that the Nexus 5 release is just around the corner. We’ve seen enough leaks, even the official packaging showing the N5 coming in both black and white varieties. If retailers in some part of the world already have the Google’s latest phone in their possession, it doesn’t seem too far fetched to believe others do as well. That being said, you might be scrounging the net looking for 3rd party outlets to ensure you aren’t one of the many prospective buyers left high and dry on launch day, even if it means paying a little extra for it. Take this latest eBay listing we were tipped off to a few moments go. The listing shows five Nexus 5s currently available for pre-order, shipping between Oct. 24th, and Oct. 26th. At first glance, it seems legit. Seller has a perfect 100% satisfaction rating, and according to the listing, you can buy a Nexus 5 32GB for a reasonable $650. Before you rush off to buy one for yourself, scroll down a little further and the description lets you know exactly what you’re paying for. 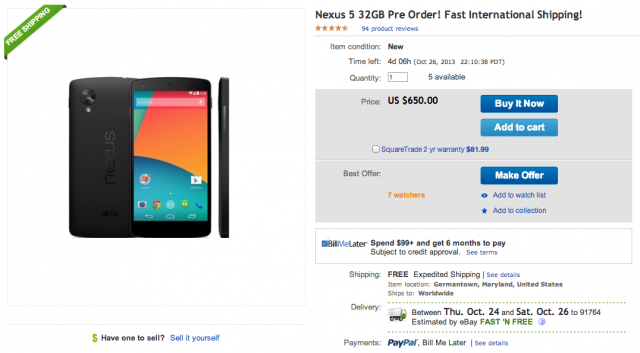 Apparently, you would only be paying for this seller to attempt and pick up the Nexus 5 32GB on launch day, in which case he will flip it and sell it to you for a sizable profit. It’s not a thousand dollars by any means, but enough to where you’d probably want to wait and try your luck on launch day which — after deciphering Kit Kat’s social updates — was… yesterday. Drat.